If I worked in a grocery store I had pack the groceries into bags matching food with stories that I had make up in my head. Little Wittians of Jr KG were told about Grocery stores with the help of the drama. 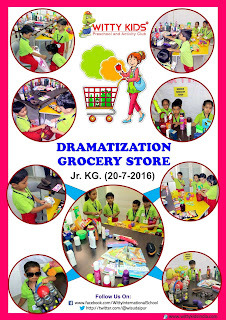 They went to the store created in the school with their peers and enjoyed doing shopping for their family members and friends. They were told how to use ATM card and money at the time of shopping. They enjoyed the activity.